SIEF is supporting the manufacture of a small demonstrator aeroengine entirely through additive manufacturing (3D Printing). Using additive manufacturing processes to optimise design and performance. The challenge is to manufacture lighter parts, decreasing manufacturing time and reducing material waste and energy costs. Taking a complex aero-engine made up of 23 different components, to demonstrate that by using additive manufacturing processes it is possible to fabricate all the components. This project demonstrates how fundamental science can be conducted in an integrated manner with industry and effectively transferred into manufacturing of a highly complex engineering system. Using computer aided design and simulation technologies for 3D printing, engineers will optimise the design to achieve maximum performance and lowest weight while maintaining the same load bearing capabilities. All the components will form a fully 3D printed aero engine. This project brings together Australia’s leading materials, design and additive manufacturing R&D capabilities, alongside industries across the materials and aero-space supply-chain. 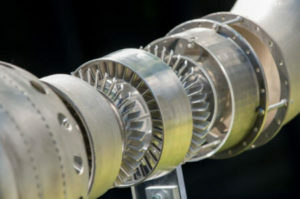 Collaborators are Monash University, Deakin University and CSIRO with investment from industry partners Microturbo (Safran) and Amaero. Developing a new manufacturing industry for Australia.